A visit to Badlands National Park in South Dakota feels a bit like going to see a miniature replica of the Taj Mahal instead of seeing the real thing after you have hung out for a week in Moab UT and traveled around southeastern Utah. But that isn’t to say that it isn’t worth seeing. On our trip back from Utah, rather than take the long trek across Nebraska on I80 I decided to head straight north from Denver up through Cheyenne, WY and then cut through the northwest corner of Nebraska and go across South Dakota. In my last batch of favorite pictures from my trip last summer I take you to the Badlands and surrounding grasslands. 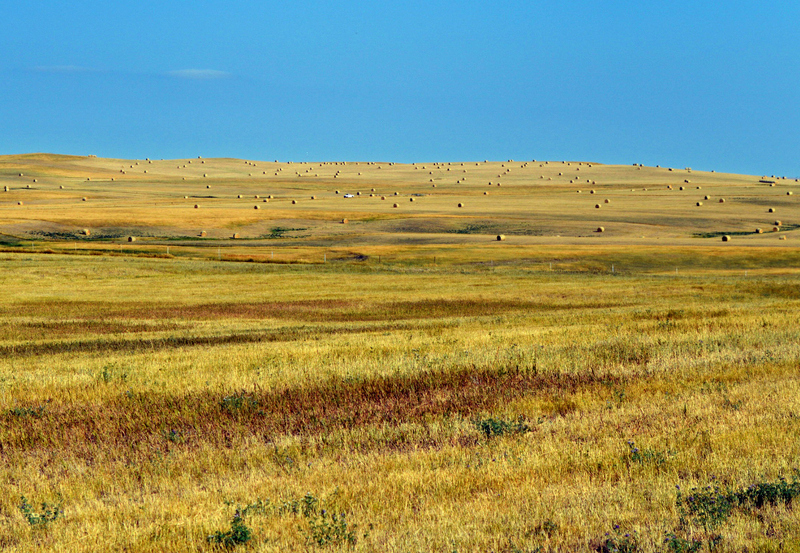 From Cheyenne (WY) to Rapids City (ND) is some beautiful grasslands. Many, some of my family included, will disagree but I find a certain beauty in the endless grassy hills and pastures. Obviously I like rocks, mountains and deserts but I just marvel at the diversity of landscapes we have in North America. God’s creation is far from boring but is immensely diverse! Above is a picture I took while driving up Rt 79 on our way to Rapid City SD. 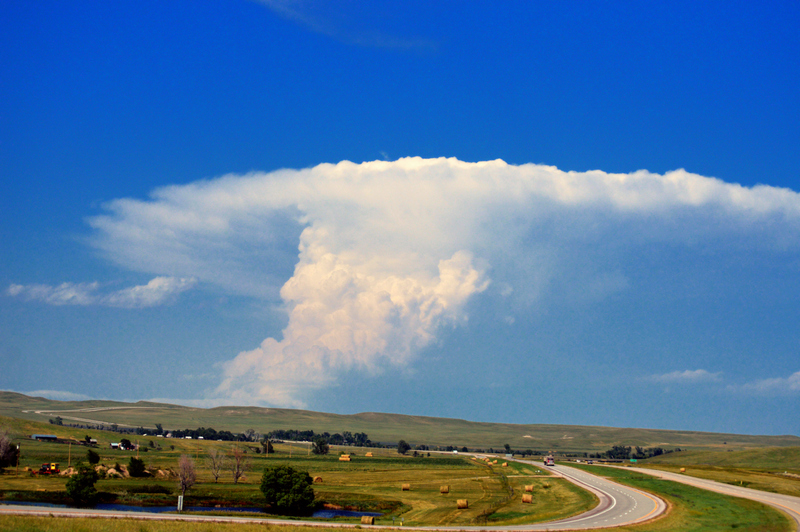 Of course the growing thundercloud caught my eye and I had been watching it for some miles but what I especially like about this picture is that captures the feeling of late summer in South Dakota: rolls of hay, green grasses, deep blue sky, rolling hills, and hot humid air all are squeezed into this one image. We stayed in Wall, SD just down the street from Wall Drug. The family was wiped out from nearly three weeks on the road so I let them sleep in the next morning. I got up at 5:30 AM and headed the 15 miles south to one of the entrances to Badlands National Park arriving just before sunrise. I took the self-portrait above with my tripod about an hour later in the park. The valleys were unusually green for this time of year (August). In this way the splash of green was a contrast to what we had been used to seeing in Utah. Layers of solidified lakes sediments and volcanic ash are in full display at BNP. 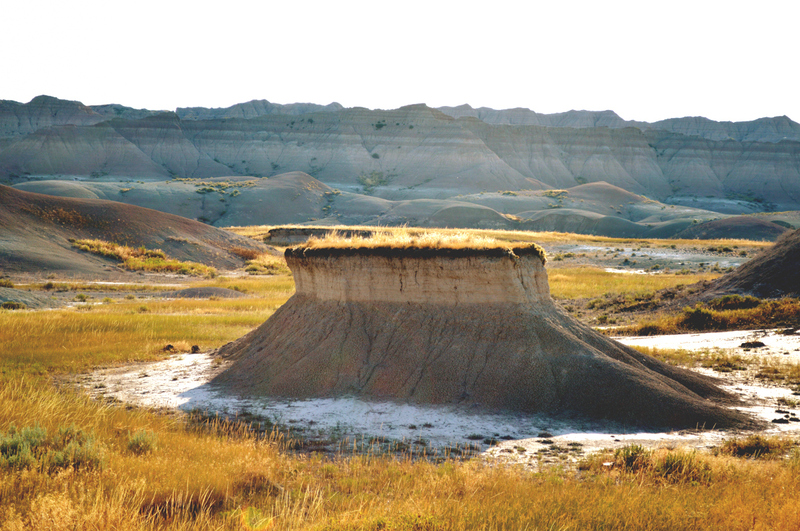 Grassy flat-topped mound in Badlands National Park, SD. I was drawn to the small 4 to 5 foot tall flat-topped mound. That white stuff is not snow (it was about 75 degrees at sunrise). Rather that is salt that has been drawn up out of the soil when rainwater evaporated. 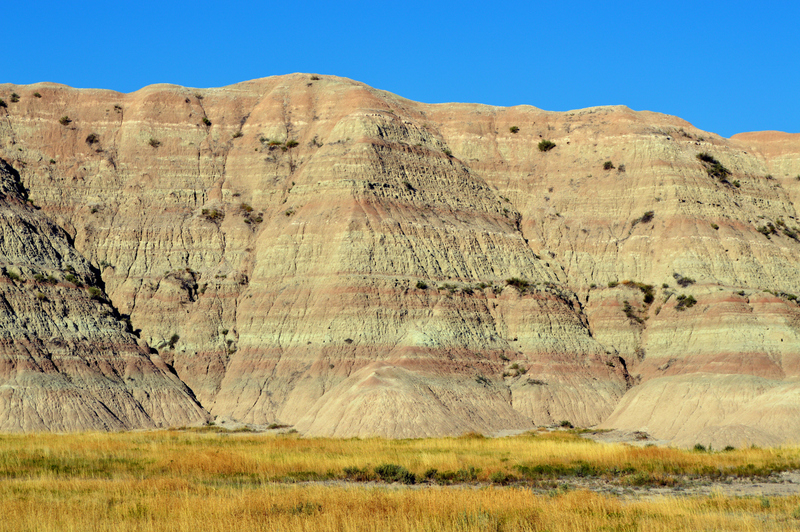 What I like about this image is that it shows the stages of erosion in the Badlands. Notice the hundred foot high hills in the background. At one time during the initial stages of the erosion of those hills there was a valley were I am standing that was right at the height of the top of that little flat-topped mound. Then as the valley downstream began to but lower down into the bedrock this valley eroded further leaving a set of additional hills with flat tops. This is like a mini-badlands within the badlands. This picture above was taken not more than 100 feet from the picture above that. The ground was covered in these thick clays resulting from fine sediment eroded from the hills and deposited in the valleys during storms. Those clays shrink and crack when as they dry forming an extensive system of mud cracks. A close inspection revealed that many of these cracks were several inches deep. Pieces of a skull on eroding from a hill at Badlands National Park. As I hiked around the base of several hills I noticed a large shiny white globular structure. I reached down to pick it but when I did so it broke into several pieces. I set it down and took this picture. I realized as soon as it broke what it was and wished I hadn’t tried to pick it up so casually. 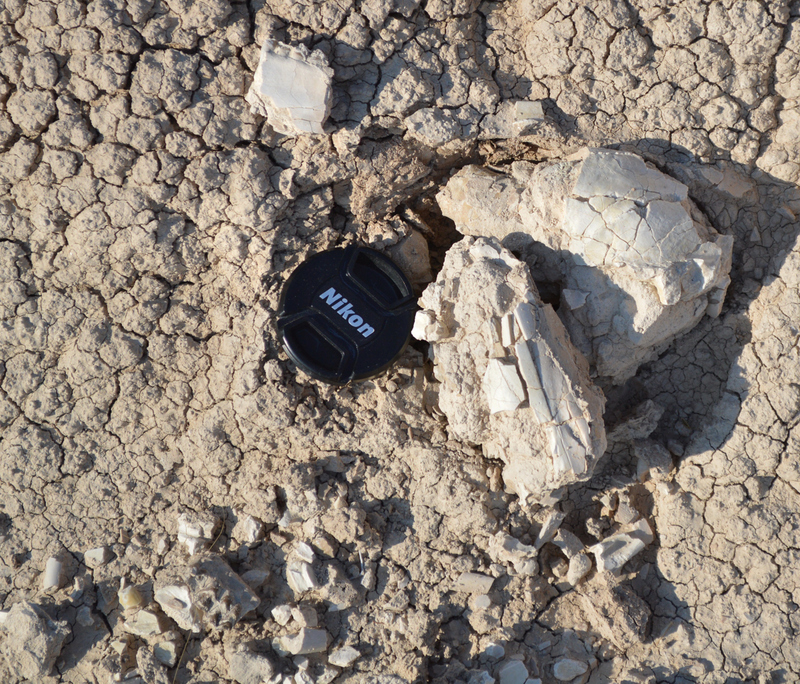 This was a fossilized skull probably of a small sheep-like herbivore. It was already partially broken before I tried to pick up the largest piece (see the pieces including some teeth in a jaw in the lower left hand corner). The Badlands are well-known for being rich in fossils of vertebrates. Since many of the layers of rock are composed of large ash falls, those volcanic ash fall killed and preserved hundreds of thousands of animals in the part of South Dakota. After finding this skull I started looking around and while I didn’t find any other nearly complete skulls I was able to find at least 50 pieces of cranium and other small pieces of bones in just about 30 minutes of hiking. Below is a small piece of the jaw of this skull showing a few embedded teeth. These teeth are typical of a herbivore. 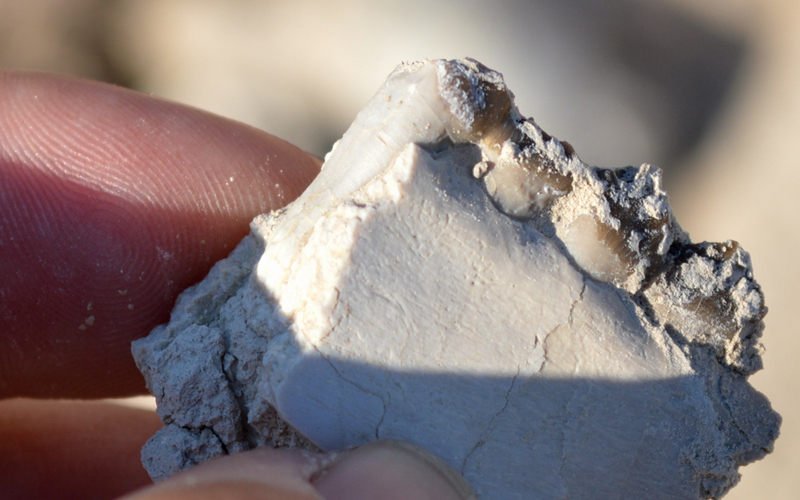 Close-up of a jaw with teeth found and imaged at Badlands National Park. Scene from Badlands National Park, August 2013. I love the greenish grass, striped hills and blue skies. Looking south at sunrise in Badlands National Park just south of Wall, SD. Landscape just a few miles north of Badlands National Park near Wall, SD. I took my picture on my way back to Wall, SD after leaving Badlands National Park. This is no more than 5 miles north of where the pictures above were taken. Aside from the expansive sky and grassland which I thought was quite picturesque I also like this image because it represents what the area of badlands used to be before being eroded. The same colorful rock layers lay just below these fields and someday the badlands will erode north right into this area and this very spot will look like the badlands do today. That day will probably be 10s of thousands of years from now. 10,000 years ago much of the national park looked like this and the “badlands” hills would have been south of where they are now. Panoramic shot taken with my phone camera just north of Cheyenne Wyoming. 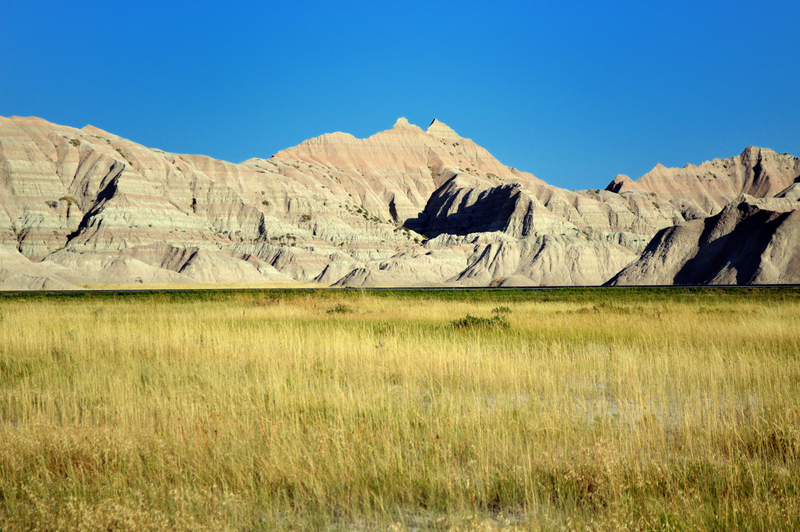 Thanks for your description and these really impressive pictures of the Badlands National Park! You’ve written some details like the tired family in the morning and your early trip the NP, that make ne believe, we have something in common… I remember a very similar situation, when I was in Brice Canyon NP sone years ago. We did the classic tour in the Southwest, but we did it in our own with a rented RV. I got really useful information in your text, so I felt standing beside you discovering the little tresures in landscape and next to your feet..
Hi, thanks for the comments. You can contact me through the contact on the blog or the email: historiaplantarum@gmail.com. I’m from the US and have lived in several places. My English is probably considered not so good by many here so I appreciate the compliment. I will be taking the family out to the west again this coming year and will be posting lots of pictures our our attempt to find dinosaur fossils.